This past week I have been at Linux Conf AU (LCA) in Canberra. An unexpected surprise was having the chance to ride a bullitt (see picture below) belonging to one of the other people at the conference. The bullitt is also made in the Netherlands, but takes a newer approach to making a bakfiets. The bullitt is designed to ride more like a "normal" bike, with a riding posture like that of a mountain bike, and only a few kilograms heavier than a mountain bike. This is possible because of the use of lots of aluminium, and lighter components, such as disc brakes, and depending on the version, external derailleur gears instead of hub gears. This makes the bullitt a great option if you have to ride up a lot of hills, or basically want to go fast, as there is no faster bakfiets. This contrasts with the traditional bakfiets, like mine, that is focussed on comfort and convenience over speed. The bullitt also has a really nice stand, that springs back up automatically, which is something that would be great to have, as it makes it easier to put the stand down when stopped at the lights, and then just ride off, without having to pop the stand up first. I have been thinking about how to retrofit this function onto my bike for a while. One thing I noticed that the bullitt lacks that would be good, is the Dutch-style built-in lock, as this means it takes a bit more time to park and depark, as you have to fish your lock out, and stow it etc. 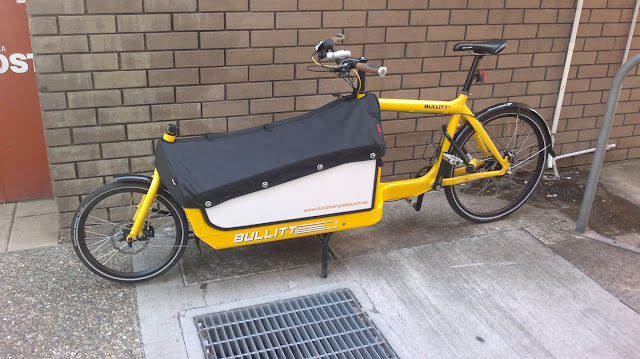 I think the bullitt is a bit smaller, with a bit less cargo space than my bakfiets, which is admittedly the super-tanker of the bicycle world. Also after riding a bike with a low step-through, it felt odd having to climb over the (fairly low) top-tube. The steering was felt a bit odd on my short ride, just like the steering first felt on my bakfiets, but I think that it would only be a matter of minutes before I got used to it. At the end of the day, the bullitt is a really nice bike, and it was great to try one out, and I think it is a matter of personal taste, and to some extent geography, as to which style will suit people. Finally, I posted something about this blog while at LCA, which as a result has been the main source of visits here this week. LCA is not your normal cross section of internet users, indeed, they are many of the creators of various technologies we all use on the web and on our computers. For example, I spoke with the author of Samba, which among other things, is used to let Linux and Macintosh computers talk to Windows computers. I also listened to the man who invented the world-wide-web. Many of these people create these valuable technologies and software packages in their own time, and without ever receiving any financial benefit. We should be appreciative of their generous contributions to society. 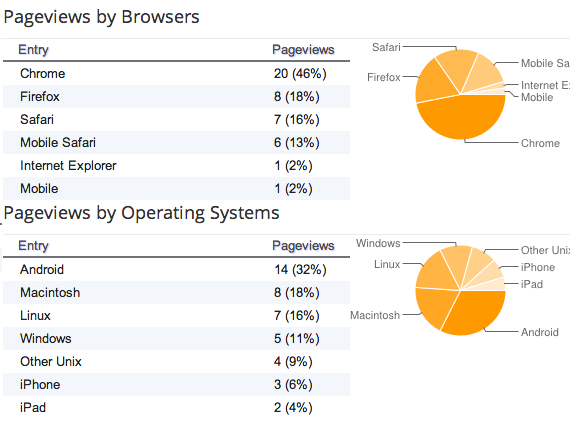 As you can see, there is a lot more Linux, Android and UNIX activity that you would normally expect.